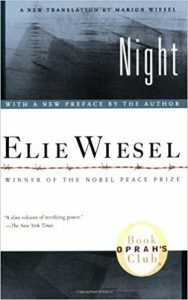 Even though Night by Elie Wiesel is not a memoir in the true sense of the word, the following study guide will frequently reference it as one due in part to the book’s collection of testimonials, depositions, and emotional honesty that is often reflective of the memoir genre. It is evident that Eliezer is meant to act, to a certain degree, as a fictional depiction of the author, Elie Wiesel. Though some details have been changed, much of what happens to Eliezer in Night also happen to Wiesel during the Holocaust. The thought-provoking and incredibly honest book Night is narrated by a Jewish teen by the name of Eliezer. The start of the book is set in Sighet, in Hungarian Transylvania. Young Eliezer is determined to study the words of the Torah (the first of five books of the Old Testament) and the Cabbala. However, his learning is interrupted by the deportation of his teacher, Moshe the Beadle. Several month later, Moshe returns, and speaks of great horror: The Gestapo (Germany’s secret police) seized control of the train he had been travelling on, forced the passengers deep into the woods, and systematically slaughtered them. No one believes Moshe’s tale, labelling him as mad. In the dawn of the spring of 1944, Hungary is occupied by the Nazis. Soon after, a succession of progressively cruel measures are forced upon the country, and every Jew in Eliezer’s town are gathered and involuntarily placed into small ghettos inside Sighet. Eventually they are corralled onto cattle cars, and their terrifying voyage commences. After having spent what seems like weeks packed inside the overcrowded car, the unwilling passengers are exhausted and feeling the pangs of starvation. Eventually, the car comes to a halt at Birkenau, mere miles away from Auschwitz. Once in Birkenau, Eliezer’s mother and sisters are taken away from him and his father, they are never reunited. In the start of several segments that Eliezer details throughout the memoir, the Jewish people are routinely evaluated to determine if they should be sent to work, or if they should be murdered. Both Eliezer and his father pass the inspection, however, before returning to the prisoners quarters, they come across an open-pit where they witness Nazis burning babies alive. As new Jews arrive, they are stripped naked, shaved clean of their hair, disinfected and dehumanized. As time progresses, their imprisoners force them to march from Birkenau to Auschwitz. Eventually, they arrive in a work camp known as Buna, here Eliezer is forced to work in a factory. Afforded no fair labor standards, the captives become emaciated and malnourished. Their only solace coming from Zionism and a desire to care for their fellow Jew. At the work camp, the Jews must ensure torturous beatings and public humiliations. Eliezer has a gold tooth torn from his mouth by a rusty spoon. The captives are made to watch their fellow men be hung in the courtyard. At one time, the Gestapo forced the prisoners to endure the pain of watching a small child die by noose. Not surprisingly, the Jews eventually adopt an ‘every man for himself’ personal attitude, causing sons to abandon or even torture their own fathers. Eliezer finds himself slipping further and further away from God and losing his own humanity. Several months after being brought the camp, Eliezer undergoes surgery for a foot injury. While he is in the hospital, the Nazis clear out the camp because the Russians are moving in with the attempt of liberating Buna and the captives. In the heart of a horrible snowstorm, the captive Jews begin a march to their death; they are being forced to run the fifty mile trek to the concentration camp in Gleiwitz. Many succumb to the elements and pure exhaustion prior to reaching the camp. Once at Gleiwitz, they are once again corralled into cattle cars and sent on another deadly journey. In Gleiwitz, one hundred Jew boarded the car, once they reached Buchenwald, only twenty remained, the others had perished. Eliezer and his father have managed to survive thus far, however, his father eventually passes to dysentery and the effects of the horrible abuse he had been forced to endure. However, Eliezer survives, in body, until the American army liberates the camp on April 11, 1945.